Today, Monday, August 30th, I fished with Gage (age 8) and Mason (age 6) Tocci, the two eldest sons of U.S. Army Captain Gary Tocci and his wife, Mrs. Destini Tocci, of Ft. Hood, Texas. The boys’ dad is currently deployed to Iraq for a 12 month tour where he serves as a Medical Service Corps officer (a physician’s assistant) running a clinic in Baghdad. The boys’ mom homeschools the family’s four children and remained home with her younger two children. A gentleman by the name of Phil Moore, who serves as a deacon and Sunday School teacher at the Tocci’s church, accompanied the boys for today’s excursion. U.S. Army Captain Gary Tocci’s boys, Gage and Mason, with Mr. Phil, a family friend from church, enjoying our 9th SKIFF trip of the year. We met at 7am, got everyone fitted with lifejackets, did some dockside casting lessons with closed-faced reels, and headed out to hunt for fish. Fishing has been tough ever since our nearly month-long high pressure system was broken by a cold front last Wednesday, but, slowly, the action has picked up since that time. 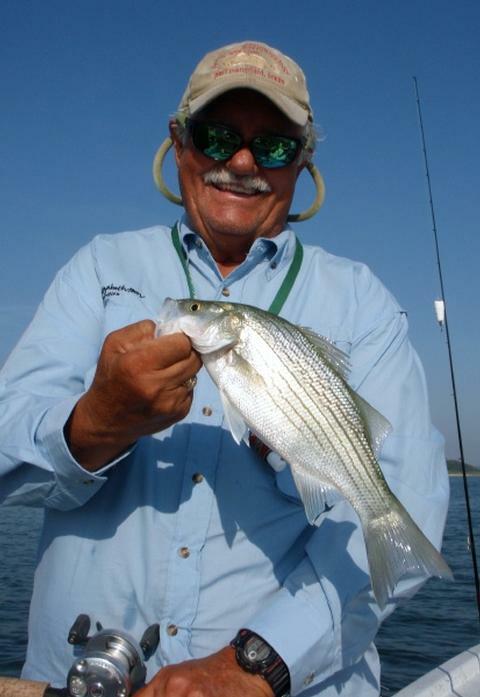 We began the day using downriggers run just above small “wolfpacks” of suspended white bass holding just above the thermocline which is now set up and very apparent on sonar at 28-29 feet. We rigged up with customized Pet Spoons and went to work. 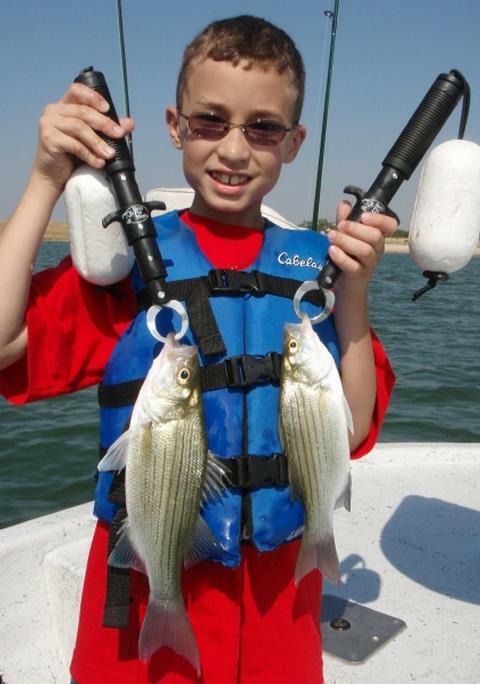 Gage, who had never caught a fish in his life, was the first to spring into action as his rod got hit first. He followed instructions well by taking the rod in hand, reeling in all slack, popping the line out of the release clip, and then playing the fish right into the waiting net. 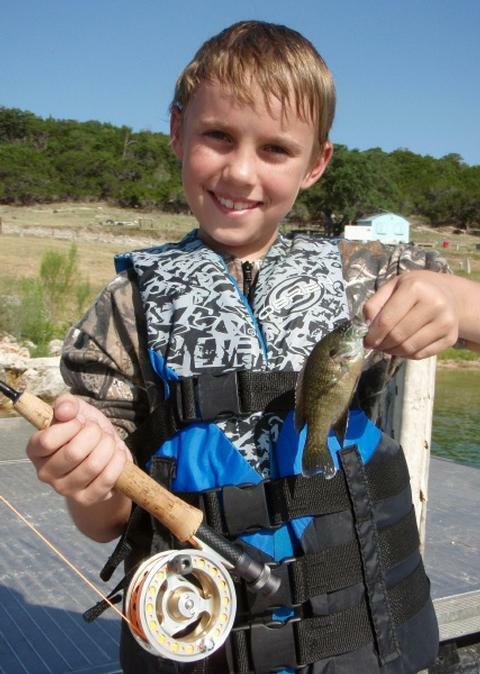 That fish went 12.75 inches and earned him a Texas Parks and Wildlife “First Fish” Award. Little brother Mason was not to be outdone and soon had on a fish of his own — a white bass taping in at just a shade under 11 inches. And so it went for about 2 1/2 hours as we fished over Areas 248 to 186, 056, and to the E. of Area 644, finding fair amounts of fish but very little bait, thus making us work for every fish we caught as the fish just weren’t really turned on. 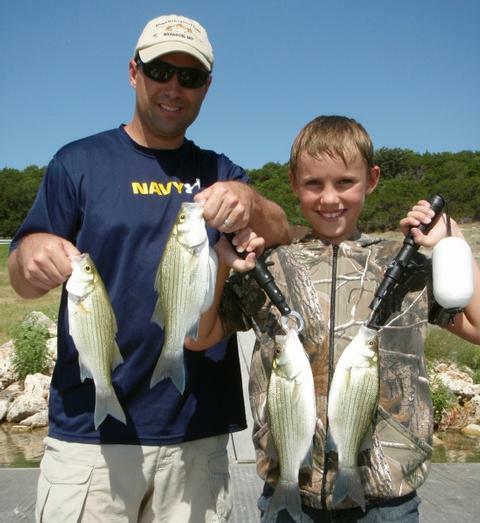 By 10am the boys had boated 7 gamefish each — 12 white bass and 2 largemouth. With the winds picking up, the fishing getting a bit soft, and the novelty of downrigging beginning to wear off, we decided to change modes and do some panfishing. We headed to Area 189, beached, and fished out of the stern. The boys rigged up with pieces of worm under slipfloats and literally brought fish in left and right for about 45 minutes until we’d caught all there was to catch within the radius they could reach with their rigs — 25 fish in all — consisting of bluegill sunfish, green sunfish, longear sunfish, and blacktail shiners. Once the fish slowed down, we agreed it was a good time for another “fast” boat ride, this time back to the dock. We took some photos of the larger fish we’d boated and then released them back into cooler, deeper water to fight another day. Along the way today we learned about patience, about culling, about buoys, about blue herons, about how a livewell works, about sonar, about where to touch and not to touch a fish, and much, much more. We caught a grand total of 39 fish today and had a lot of fun doing it!! Thank you for the part you’ve played in making this day happen for these young men. Today’s “Kids Fish, Too!” trip was a reward for two hard-working kids, Stephanie N. and Jonathan M., both of Killeen. These kids earned this trip by being the winners of the “Bring a Friend to Vacation Bible School” contest held at Memorial Baptist Church in Killeen back in July. Both kids brought their moms (Monica and Grissell) along on this trip, as well. Jonathan got his licks in first today, and show us the first fish he’s ever caught (on right) and a larger cousin that came along later in the trip!! 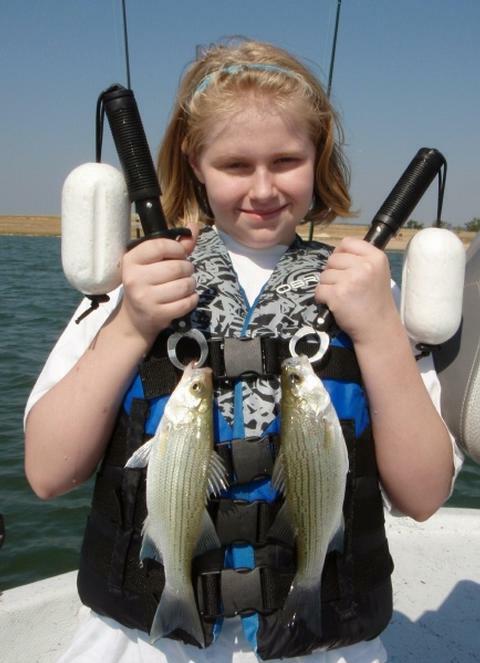 Stephanie holds a nice pair of white bass here. The one on the right, the first fish she’d ever caught, earned her a “First Fish” certificate from TPWD, too. The morning was unusually cool for late August in Texas — only 67 degrees before sunrise, on the tail of a clear night left behind by a cold front that passed through over the past several days. As the sun came up, the downrigger balls went down and we got right to work. The kids placed the lines the right distance behind and beneath the boat and the modified P12’s worked their magic on the end of our lines. Over the first 30 minutes, all spent in the vicinity of Area 176, we boated 6 fish before things went soft. We headed downlake an worked from Area 041 through 205 and over to 644 with only one more white bass to show for our efforts here. I was concerned as the skies were bright and the winds were still — a really bad combination. Well, we tried one more place, Area 458, looking for fish and shad and came up empty handed, so we changed over to panfishing a bit earlier than usual, but all turned out well, as both kids REALLY liked that kind of fishing. As we began fishing with slipfloats for sunfish, both of the kids got the hang of setting the hook when the float was being pulled away and did very well as a result. We made 3 moves in the same general vicinity (Area 231) and found ample fish at each stop along the way. We stayed on these fish for about 90 minutes and boated a grand total of 54 fish here including bluegill sunfish, green sunfish, and blacktail shiners. The kids’ attention started to wane a bit, so, seeing that a SE wind was beginning to blow (the first wind from that direction in 5 days) I suggested we shoot for one more “big fish” a piece before wrapping up our day, fairly confident we’d find fish getting active as suggested by the wind direction. We headed to Area 056, put our downriggers out (the kids were now aces at this) and in no time Jonathan was fast to a short largemouth and Stephanie had yet another white bass yanking her rod down. Both kids brought their fish to net and we closed things out on a good note with a total of 65 fish on the day. Great job, kids, at being both fishers AND fishers of men!! This morning I got to fish with Matt, Karsyn (8 years old), and Heath (4 1/2 years old). of Round Rock on a “Kids Fish, Too!” trip. You’ve heard that saying, “All good things must come to an end.”? Well, we officially reached an end to the white-hot topwater that had been going on at Belton in the morning for the last several weeks with the arrival of the season’s first mild cold front on Wednesday. The front brought clouds, cooler temperatures and a N to NE wind with it, and the fish just went into a funk as they typically do in August and September given such conditions or “hurricane” weather involving a deep low pressure system. 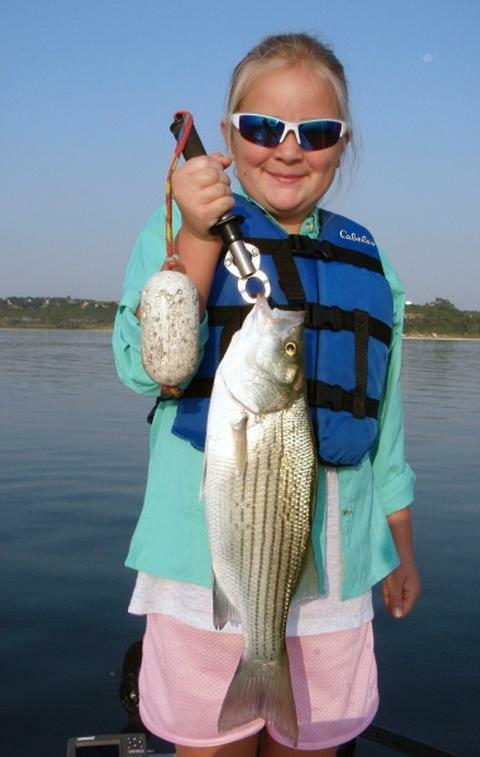 Karsyn with our big fish of the trip, a 3.5 pound 19.0 inch hybrid striped bass. Karsyn, Matt, and Heath — life jackets on, ready for adventure!! We got underway right around 6:50 after doing some dockside instruction on casting with closed-face reels. I was initially encouraged as we approached Area 487 because about 10 minutes prior to sunrise I saw a small pod of white bass chasing a school of shad over open water and thought perhaps we’d see that continue as the skies brightened. But, that was to be the ONLY topwater we saw all morning. In this same general area I saw ample gamefish, all holding suspended at 27-29 feet over a deeper bottom. We geared up the downriggers and put 3 white bass in the boat in the first 20 minutes or so of fishing between Areas 487 and 488. Then, things went quiet and never really perked back up all day. After making several runs over these suspended fish without a hookup, we ran to a few areas but found little in the way of bait or suspended fish. Eventually, we returned to Area 487/488 and found the same fish in the same orientation but they were just locked down and unwilling to do much. We did pick up a legal hybrid going 19 inches and 3.5 pounds (Karsyn’s biggest fish ever!) 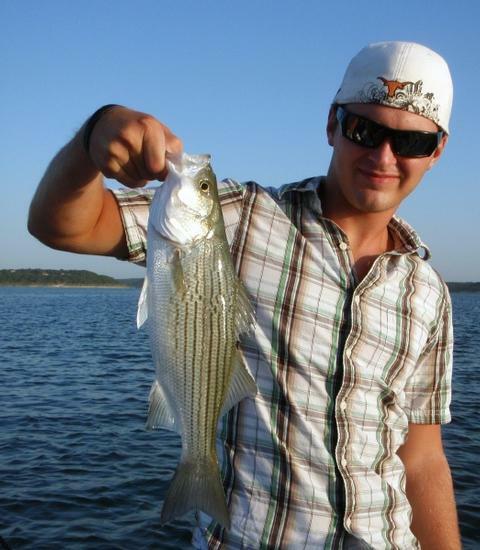 and one more white bass, but subsequent passes went untouched. I should mention here that Heath did a great job helping me net his sister’s big fish! I decided to switch over to panfishing at this point, a bit earlier than I’d hoped. We beached at Area 492 and used slip float rigs to target the ample numbers of sunfish of all sizes in this area. Over the next hour and a quarter we boated 41 fish consisting of bluegill sunfish ranging from 3 to 7 inches in length, with a few black-tail shiners mixed in. This was easy fishing and it fully engaged the kids as they had a rod in hand and had to keep a sharp eye on their float, so they stayed focused on the task. I was actually surprised at how long this held little Heath’s attention. After a while we wore the sunfish thin and I asked the kids if they’d like to try for some bigger fish again before we concluded our trip. Heath was getting sleepy in dad’s lap, but Karsyn was ready for more. We again looked at Area 487/488, again found fish here, and again failed to get them to respond. Finally, we headed to Area 305 to 509 and right on a minor breakline, with baits down at 29′ we had a release. Karsyn jumped right up and brought that fish in — a smallmouth bass. We ran a few more passes in this area, but suspecting diminishing returns were in store for us, we called it a day at that point. As I got the kids back to the dock I asked each of them what their favorite part of the trip was. Karsyn immediately answered, “Catching that big fish!”, and Heath said he liked helping his sister land her big fish using the net. So, our tally today included 4 legal white bass, 1 legal hybrid, a short smallmouth, and a mix of 41 sunfish flavored with a few black-tail shiners. Due to the touch conditions for the white bass and hybrid striped bass this morning, I went ahead and postponed a trip scheduled for this evening at least until we see a southerly component return in the winds. Hopefully our hot, dry, stable conditions aren’t yet done for the season — only time will tell. 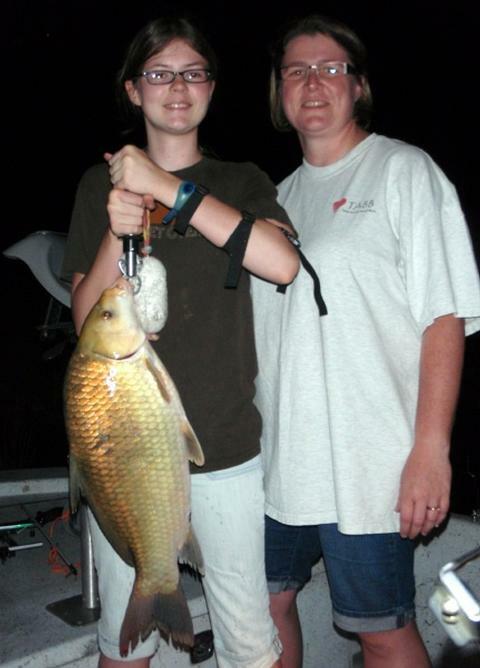 Stillhouse Hollow Fishing Guide Report — 26 August 2010 — New Lake Bowfishing Record!! Earlier this week I got a call from a family in Round Rock asking about the possibility of introducing their 14 year old daughter to the sport of bowfishing. Tonight we gave just that a try. I met Carl and Jenn D. and their daughter, Jess, at Stillhouse for this big adventure. Jess and her mom, Jenn, are all smiles after 3 hours of persistence paid off in a big way with a Jr. Angler Bowfishing lake record Smallmouth Buffalo!! Our first hour or so was spent getting equipment adjusted and practicing overcoming the hurdle of light refraction. Jess shoots a recurve and didn’t yet have the reel, fiberglass arrow, or bowfishing line attached, so we got all that taken care of, then began practicing with the rig by shooting at a weighted plastic jug. If you’re unfamiliar with bowfishing, the most difficult part is training/reminding yourself to shoot much lower than the target appears, as the water literally bends the light rays and makes things appear other than where they are actually located. Jess was able to sink 2-3 arrows in the gallon jug over the course of several attempts, so, we then ventured out to put her into some real-world scenarios to work out the kinks. We searched the shallows from 9pm to 12:45am using a strong spotlight and found ample fish in shallow water in and around the Area 203 cove, including carp, smallmouth buffalo, and small longnose gar. We only came upon 2-3 short drum all evening. Jess is a pretty good shot on stationary targets, but, like most beginners, found it a real challenge to shoot targets that were 1) moving, 2) of varying distances and depths, and 3) not where they appeared to be. But, the important part was that she remained focused and persistent and didn’t get flustered after missing a few times. I coached her on allowing the fish to wear itself out and not risk pulling the arrow free by pulling against the fish as it was pulling out line, but rather to take in line as the fish allowed. After a few moments we brought the fish to boatside and netted it as mom held the spotlight and dad ran the video!! Jess had broken the ice and had joined the ranks of successful bowfishers!! A check of the record books following the trip confirmed that no entry for this species had yet been submitted by a bowfisher on Stillhouse. Suspecting this was the case, we took all the required measurements and photos while on the water in order to sumbit an application for Jess’ fish. This fish measured 23.25 inches and weighed 9.25 pounds. Jess was now ready for more, but the fish had all but concluded their feed in this first 4-5 hours of darkness and were now much harder to come by. We found a few fairly technical shots for her to take, but, as we closed out the night, the count remained at 1. I fished this morning with two of our newest Texans — Mark G. and his eldest son, 19 year old Wes. Mark, his wife, and 3 sons recently relocated to Harker Heights from Boise, Idaho, so Mark could serve as the Minister of Music at Memorial Baptist Church in Killeen. We linked up at 6:00am and drove to the lake together as I desired to on the water as the sun was rising (around 7:10 today) as that has been when topwater action has been kicking off on Belton lately. We got launched, brushed up on the fishing gear and casting, got down how we’d be arrayed in the boat when the fish came to the surface, and then headed out to look for them. Our preacher encouraged us to meet people in person this week, not just call, text, or Facebook them, so, Mark and I met up face-to-face and went toe-to-toe with some of Belton’s best. 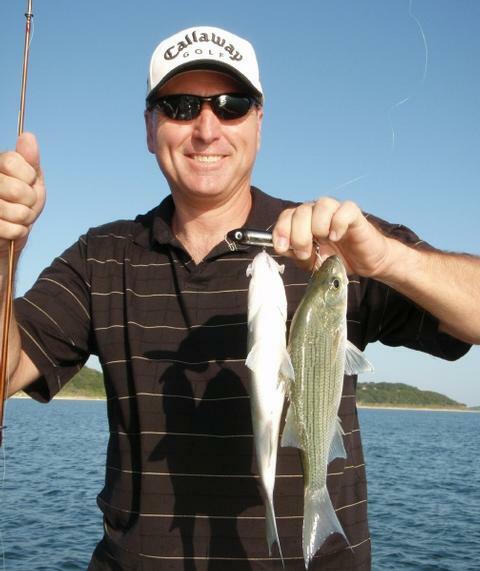 Here Mark shows off his 2-for-1 — two white bass boated at the same time on one lure!! Wes holds a personal best — the largest fish he’s ever caught. 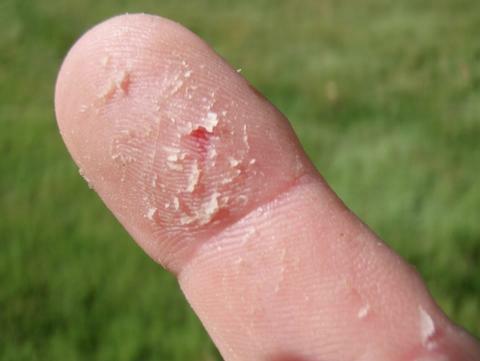 This is what my right index finger looked like after unhooking 146 fish, most of which were hooked on lures with treble hooks! I got a bit concerned when, by 7:15 nothing had happened — no bait seen swimming, no fish feeding, no birds flying — just nothing. We had a full moon very intensely shining all night last night through a cloudless sky to the point that it cast a definite shadow and I’ve noted before that this seems to hinder daytime fishing. But, all was well when by 7:25 or so we spotted a large school of mixed white bass and short hybrid stripers out in open water directly over Area 212. Long story short, we stayed on top of these fish for 2 hours and 20 minutes as they moved nearly a mile across open water from E. to W., eventually sounding at a place in open water found well off the tip of Area 358. As we started fishing, I put Spooks on for all of us, mainly to ensure some immediate hookups for Mark and Wes. Eventually, my fingers got so chewed up from dealing with 6 treble hook points while unhooking each fish, that I switched us over to single hooked soft plastics and we did just as well, if not better, on these as I was able to unhook fish that much quicker and get the boys back on top of the fish. By this time, their casting distance was increasing and they were getting more polished at playing and landing the fish, so, our efficiency improved for that reason, too. When all was said and done, we’d boated exactly 146 fish as counted on my “clicker”. A few of our trip highlights included: 1) Wes catching the largest fish of his life, 2) Mark catching more fish on this trip than he had in all other trips in his life, combined, and 3) Mark catching a 2-for-1 — two white bass striking the same lure and being successfully boated at the same time. The action subsided by 9:45. I told Mark and Wes that anything that happened from this point forward was going to be anticlimactic compared to the long, aggressive feed we’d just witnessed, so, before the wind died and the sun began to roast us, we headed back to the dock a bunch of happy campers! Wind: Winds were light from the SE at around 5 until ~9:00 when they tapered off to SE2 to light and variable . I enjoyed fishing a pretty intense trip with 3 fired-up young men from north Austin today — Reid, Zach, and Alex, all accompanied by Reid and Zach’s dad, Craig, who runs a veterinary practice near Mansfield Dam at Lake Travis. I use the word “intense” because of the excitement level of the boys from the time they learned of the trip earlier in the week, right up through the taking of the last photo on the dock today, and also because of the intensity level of the topwater feeding fish we found today which always serves to boost the adrenaline a bit. Zach with one of his better fish taken on topwater today – a healthy hybrid. Alex holds a hybrid taken on a Cicada bladebait just sub-surface. 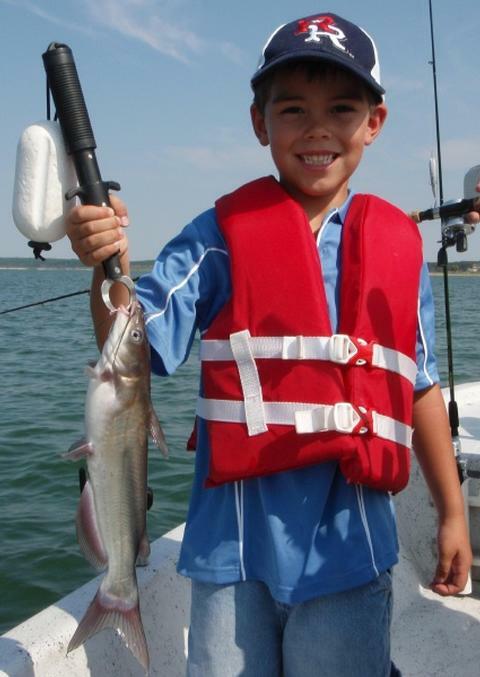 Reid’s all smiles over his big blue cat that hit a downrigged spoon going about 3 mph. I welcomed the boys at the courtesy dock and immediately put a closed-faced outfit in their hands and made sure they could use it safely and appropriately so that if we encountered topwater action, which I had a hunch we would, we could take full advantage of it. Based on the outcome of the practice lessons, I seated Zach on the front deck to my left, Alex on the front deck to my right, and little Reid on the back deck with his dad providing some one-on-one oversight. This setup worked really well — all the boys caught fish steadily and no one got hooked!! As we waited for the 7:07am sunrise and the action that arrives with it, we arrayed ourselves in our battlestations and did some practice casts so everyone knew where they were supposed to cast once I got us close to the fish. Right on time (right at sunrise) the fish began feeding on the surface from Area 027 to Area 133, heading generally from W. to E. in numerous distinct schools. I tried to keep us in the fray as best I could so all boys had a shot at active fish, and we enjoyed success “early and often” today. I started the boys off with Sassy Shads due to their single hook and propensity to stay tangle free, knowing that the upright-riding hook on those lures leave something to be desired. Once I saw the boys getting the hang of things, I switched them over to a more effective bladebait. Then, finally, when I saw the novelty of using a blade bait was wearing off, we switched over to topwater lures (Sammys and Spooks). We enjoyed an exceptionally long feed this morning which finally died at 9:40 — that’s 2 1/2+ solid hours of topwater!! During this melee, we boated 102 fish including white bass ranging from 10 to 13.5 inches, and short hybrid ranging from 12 to 17 inches. When the topwater ended, I picked right up downrigging at the first breakline to the E. of where the fish finally sounded, along the 28-29 foot contour stretching just shoreward from Area 080 to Area 347. We put the balls down at 22-25 feet and used both a small white Pet and a White Willow. The White Willow did a bit better on the final 9 fish we boated today. This catch of 9 consisted of 2 short hybrid, 6 white bass, and 1 blue catfish (which was caught by Reid, who was very excited to land something that the big boys did not). By 10:45 we’d had the boys on the water 4+ hours, the fishing was waning, and this particular area had given up all it was going to. Craig and I concurred this would be a good stopping point, so, we wrapped things up and headed back to the dock for some photos and farewells. In all the boys caught 111 fish (Craig and I never did cast a line). I had an evening trip to prepare for, so, as Craig and the boys headed out, I went back out on the lake to search over some areas to see if I could find bait concentrations. I was fortunate in that I did locate some solid schools of shad from Area 181 to Area 493. I mentally noted this and was about to head out looking elsewhere when a small flock of terns showed up and started looking “fishy” right in my vicinity. I just cut the engine and watched them and sure enough, one dipped, then another, then the whole flock was feeding. By then the fish beneath the bait had caught up with that bait and now fish became visible on the surface. I was right in the middle of a feeding frenzy. Some of the shad I saw skipping out ahead of the gamefish were up to 4 inches in length, so, I baited up with a soft plastic and went to work. In about 25 minutes, I boated an additional 31 fish — a roughly 50/50 split of solid white bass and short hybrid up to 16 inches. By now it was ~11:45 and I decided to hang it up to get some lunch and a nap before the evening trip began at 5:30pm. Wind: Winds were light from the S at around 5 until ~9:40 when they tapered up quickly to S10, then eased off and leveled out at S8 by trip’s end . On the heels of a very aggressive topwater bite this morning (142 fish boated), I headed back out this evening in search of more action for father and son team Doug and Elliot B. of Killeen. Doug works locally in the pawn industry, and Elliot is about to leave for his junior year at Texas A&M. This was a send-off trip of sorts for Elliot. Doug with a 3.25 pound fish, and Elliot with our trip lunker, exactly twice the size weighing in at 6.50 pounds and 24 1/8 inches. Doug with his best fish going 4.75 pounds. It fell for a modified Pet Spoon. We met up at 5:30p, as my evening trips of late haven’t really seen much action heating up until around 6:30pm. I even pointed out to Doug and Elliot that things would likely start off slowly and build to a peak just before sunset. We began out day with small baits out on the downriggers working a staggered ellipse over top of Area 473. There was ample bait here, as well as suspended and bottom-hugging schools of gamefish showing well on sonar in 25-26 feet, thus, we ran our balls just over their head with a White Willow on one setup and a white Pet on the other. Both rigs performed identically, allowing the boys to boat 7 fish each over the first hour of the trip. The catch included 1 largemouth, and a mix of 13 whites and short hybrid. Around 6:30 the bite here got soft, so, we made a move. I took us to Area 084 hoping 1) that we could find suspended fish here, and that 2) if an evening topwater bite was to occur, we could see it from this location. Well, #1 worked out, but, the 12-14 mph SE wind kept #2 from happening. However, the fish we found here were quality fish. We boated 24 fish in this area taking a N-S circuit over Area 084. Of these, 10 were keeper hybrid, with the largest going 6.50 pounds on a certified scale. 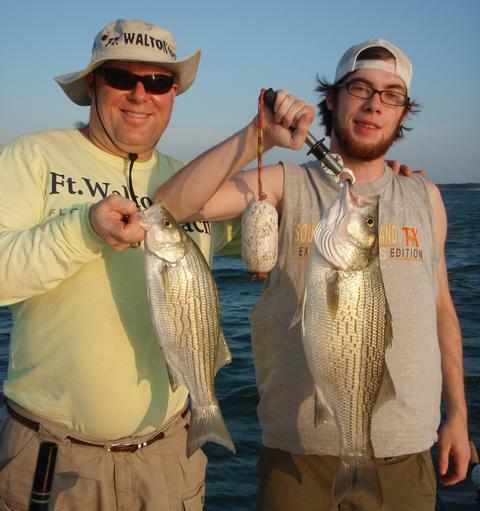 Additionally, we caught 2 barely short hybrid, and 12 white bass. The fishing got soft around 8:20, but, we landed our final fish right at 8:40. All of these fish were taken on larger P13’s in both white and silver. To say the least, Doug and Elliot were a bit competitive. The two both asked regularly for an update off of my “clicker” (the device I used to keep a very accurate count of the number of fish we’ve boated). When all was said and done, both gents boated exactly 18 fish despite mixing and matching lures. By 8:45 things were over and we were headed back to the dock. So, what do guides do on their days off? Well, speaking just for myself and my friend Bruce Shuler of Getaway Adventures Lodge down in Port Mansfield, WE FISH!! It was really nice today to fish alongside Bruce. With someone so knowledgeable on board I didn’t have to provide guidance, untangle lines, unhook fish, or do anything except reel in my share of the 110 finny friends that cooperated for us today. We began our day before sunrise hunting for topwater and, just moments before sunrise it began in earnest, increased very dramatically at around 7:05 with the brightening and complete rise of the sun, then stayed steady for about an hour, and finally tapered down to zero by around 8:40. Any day with over an hour of topwater is a good day, and we made hay while the sun shone and caught ’em up while we could. 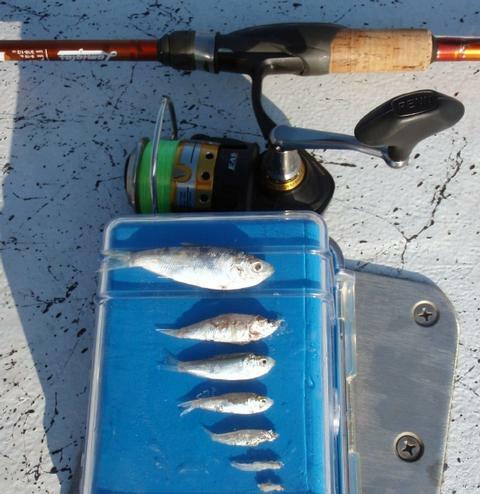 This photo shows the variety of bait sizes present for the white bass and hybrid to feed on during this morning’s early feed. Every one of these was regurgitated on by boat deck by fish we landed. Bruce lips one of our larger fish taken today. This one came on the downriggers. Most of the topwater fish we caught, hybrid included, were smaller than this one. Topwater tends to be an exciting quantity over quality affair this time of year. 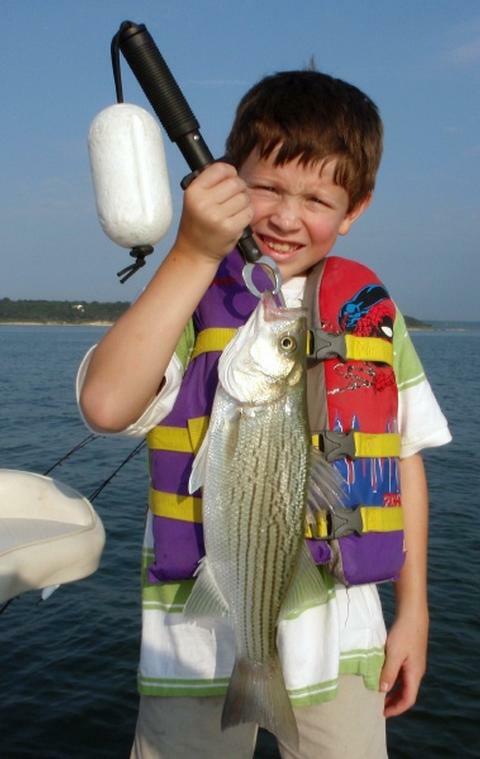 The fish we found were a mix of white bass of all sizes, as well as short hybrids. In this early morning topwater the white to short hybrid ratio was roughly 1 to 6. I used a Cork Rig on top and Bruce threw a blade bait just sub-surface and we did equally well. All of this action took place between Area 027 and 014. By the time the action ended, we’d boated 73 fish and returned all of them to the water. As this early bite came to an end around 8:40, we checked a few areas for bait and fish with sonar and found some stratified hybrid hanging around 24-26 feet over a deeper bottom along the breakline near Area 84. Bruce had never fished with downriggers before, so we rigged up a very basic spread with 2 rods and 2 ‘riggers, and equipped each rod with a single spoon (1 a white Pet, 1 a White Willow) and began working the area over in staggered ellipses. 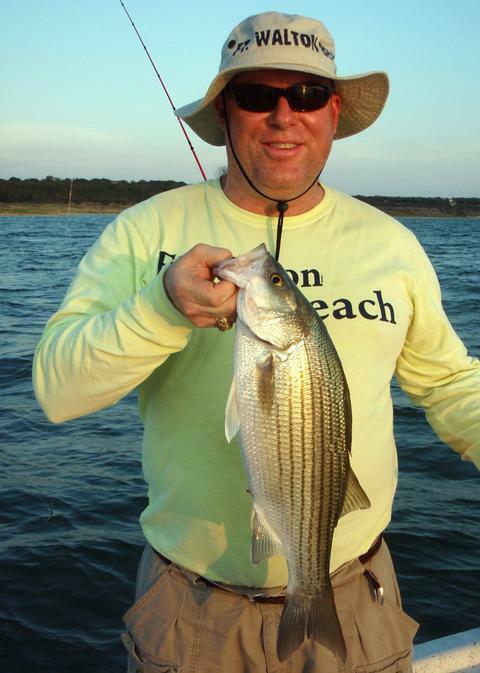 We boated 2 hybrid and 2 white bass in 5 passes before the fish began to thin out. We then headed out in search of more bait and fish, but found things pretty scarce. We did come upon a small group of fish showing 20-30 arches just suspended off bottom along a breakline at Area 154. We vertical jigged right over top of these fish and boated 1 drum and had more missed strike and that was it. We had about decided to call it a day with 78 fish boated, but, since Bruce primarily wade fishes in the shallow waters of the Laguna Madre, he hasn’t really kept up with all the advances in sonar, including the side-scan imaging. We decided to idle over some submberged trees, the tops of which come to within 20 feet of the surface, and which are rooted in about 55 feet of water, just so he could see a side-by-side comparison of the side-imaging versus traditional sonar. Well, as we were headed to this timber patch, we saw several “popcorn” schools of white bass feed on topwater for just seconds at a time but ignored them, knowing they’d soon disappear. Then, we spotted a school working bait up into a corner nearer to the shore (at Area 180) than any of the other schools we’d seen. I commented to Bruce that schools like that will sometimes stay up when they’ve go the bait penned in like that. We kept an eye on the fish and on the pretty view of the submerged timber we were seeing on sonar and, once Bruce had the oppportunity to compare the images, we made our way over toward the schooling fish. In all, they stayed up for about 20 minutes — just long enough for us to shoot for and surpass the magic 100 mark. By the time this school was finished feeding, we’d boated 32 additional fish, again with Bruce throwing a blade and me throwing a Cork Rig, and the two of us doing equally well. We both really needed to be on our way to appointments later in the day, so we jokingly agreed to drive back the the ramp with our eyes closed so were weren’t tempted to make any more stops for “popcorn” white bass! Wind: Winds were light from the SSE at around 3-5 at the start of the trip, slowly slacking off to near calm by trip’s end . Stillhouse Hollow Fishing Guide Report — 16 August 2010 — New Fly Rod Lake Record!! Today I fished with a party of five including 2 adults (chaperoning) and 3 kids (fishing). At 6:40am I welcomed aboard two cute, but terribly sleepy little girls — Ellie (6 yrs.) and her sister, Julia (4 yrs.). The girls’ cousin, Creighton, age 11, joined us, as did his dad, Todd, and his uncle (the girls’ dad), Adam. Adam hails from Deerfield, IL, and Todd lives in Leander, TX. Creighton O. of Leander, TX, with a new fly fishing lake record — a 0.25 pound, 5.75 inch green sunfish. Uncle Adam and Creighton with our best 4 whites taken on downrigged spoons this morning. Adam contacted me early last week and had a couple objectives. First and foremost he wanted to put the kids on some fish. He also has a personal interest in fly fishing and recently bought nephew Creighton a fly fishing outfit and hoped I could introduce him, and possibly 6 yr. old Ellie to the arts of flycasting and flyfishing. Well, here’s how things panned out… first, both the weather and the fish cooperated. We got on the downriggers over suspended fish early and often and boated 15 fish (12 white bass and 3 largemouth) with 3 more lost by around 9:00am. This took place between Area 658 and 040 (12 fish), than to the N and W of Area 644 (3 fish). The girls, neither of them morning-people, then snuggled into daddy’s lap for an on-the-water nap while Creighton stayed on high-alert status soaking in every ounce of the angling experience he could. He really caught on quickly to the various techniques we used and understood why we were doing what we were doing. As the fishing slowed a bit early this morning, right around the 9:00am timeframe, we decided to head back to the dock, get the girls stretched out in the A/C, and continue the battle on the water with just Creighton and Uncle Adam aboard. I worked with Creighton, handing him my favorite 2 weight flyrod (a TFO Pro Series rod) and getting him into the rhythm of keeping the flyline aerialized. Once he got the hang of that, we added a stop to the motion so as to land the fly on the water. We took these two skills and put him on top of some rip-rap and in no time he was fast to a nice green sunfish. As he continued, the aiming and fly placement became more and more natural, so we added a stripping retrieve to his repertoire, followed by a correct hookset motion, and, finally, a roll cast for times when a backcast is not possible. Needless to say, Uncle Adam was ecstatic (…and the girls were still sleeping soundly in the truck with Uncle Todd!!). Creighton boated one more smaller green sunfish, and Uncle Adam took 3 greenies, putting our tally now at 21 fish on the morning. We decided to move a bit and give a floating hopper pattern a try over a hydrilla bed. We had 4 or 5 takes, but none of the bluegill doing the taking had mouths large enough to swallow the hopper, so, we came up dry on that effort at Area 200. As we wound down our trip at around 10:30, I reminded Creighton of the analogy I’d described earlier — that flyfishing is to fishing what bowhunting is to hunting — it’s intentionally handicapping yourself by choosing a method that demands more skill and offers less productivity, but which, because of those very things, can be very satisfying. By way of comparison, at trip’s end, I helped Creighton bait up a bream rod with a slip float and in a matter of minutes he boated 9 fish (bluegill and green sunfish) where (at Area 239), just a little while earlier, he couldn’t buy a strike on his fly. As it heated up quickly around 10:30, we took all the necessary photos and measurements for Creighton’s record application and said our goodbyes. I don’t know who got hooked more deeply today, Creighton or the fish!! 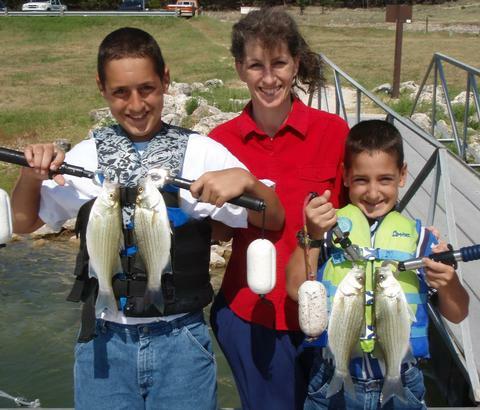 John (13), Daniel (8) and their mom, Katherine, hold the boys’ best 4 fish from today’s trip. Prior to today’s outing, Daniel had never caught a fish before. 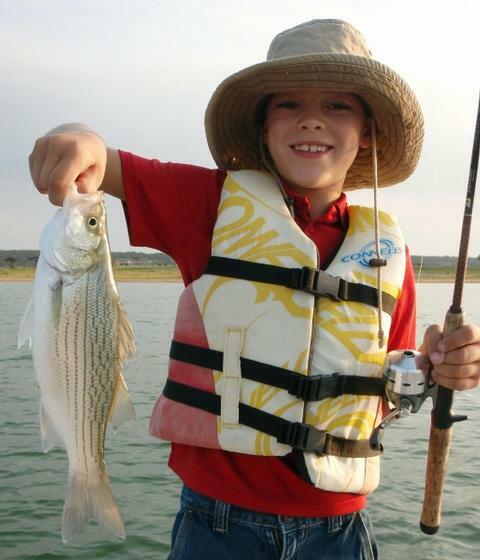 This white bass earned him a TPWD “First Fish” Award. On Saturday, August 14th, I took two more of the ten Goode Family children out fishing on Stillhouse Hollow. Their father, Lieutenant Colonel Keith Goode is currently stationed in Baghdad, Iraq with III Corps and is due to return to the U.S. in early 2011. Today I welcomed 13 year old John and 8 year old Daniel aboard. 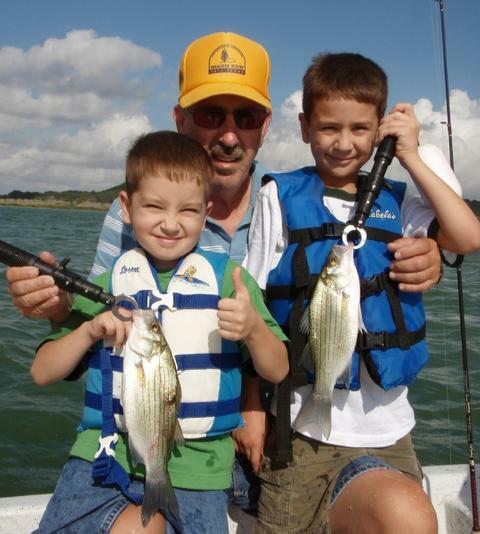 John had some previous fishing experience in Boy Scouts, and little Daniel had never caught a fish before. By trip’s end, however, he’d done his part to put 40 fish in the boat, thus earning him a Texas Parks and Wildlife “First Fish” award! We began this trip by getting the boys fitted with life jackets, then doing some introductory spinning gear practice in case we came across any topwater action. We then headed out for open water and used sonar to find the baitfish which led us to the gamefish. This morning, we found two active congregations of white bass holding at 22-25 feet over a 23 to 28 foot bottom first at Area 040 to 658, then at Area 644 to 204 . We worked Pet Spoons right over these fishes’ heads and began to score right away. The boys worked well together and got the hang of the downriggers very quickly. 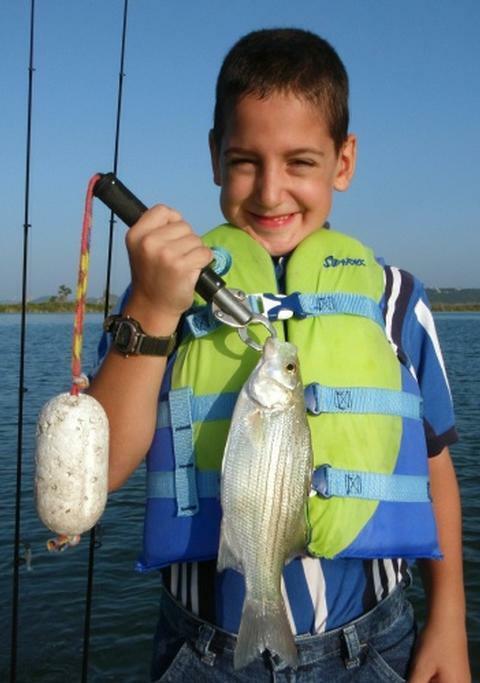 Then it happened … after boating the 4th fish, Daniel asks, “Mr. Bob, how many fish did our brothers catch last week … wasn’t it 26?” I told him that was accurate. He responded, “Well, we need to beat that!!”. So, with a goal now before us, we tried to be as efficient as possible and make every move count so we could better that 26 fish count from last week. By 9:30 we’d seen 1 drum, 2 largemouth, and 25 white bass come over the sides, putting our fish count right at 28 fish just as the white bass were beginning to turn off for the morning. With the family record broken, I explained to the boys that we could continue doing what we’d been doing, albeit with a lesser chance of success, until mom was to arrive around 10:45, or, we could change up a bit and shoot for some sunfish in shallow water. The boys went for Plan B, so, we headed for some hydrilla patches and the sunfish that inhabit them and spent our last hour or so taking sunfish out of shallow water on dainty rigs baited with worm at Area 659. The boys each landed 6 sunfish, taking our tally up to 40 fish for this outing. Mom arrived in the red family mini-van right on time, so, we packed it in, headed to the dock, took some photos of the boys with their best 4 fish alongside mom, and bid one another farewell. These boys were so well-behaved and cooperative that it was a real joy to have them onboard. They were considerate of one another and each was genuinely concerned that the other did well — like brothers ought to be. 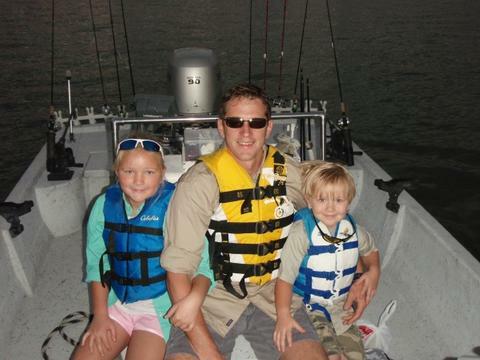 Thank you for your support as we put our deployed soldiers’ kids on the water! !